Palak Paneer, is a very healthy and nutritious Paneer and Spinach dish that brings to you the goodness of Punjabi Dhaba meal. The balanced flavors, the splendid smooth spinach gravy, the soft Paneer cubes, everything about this dish is absolutely tempting!! 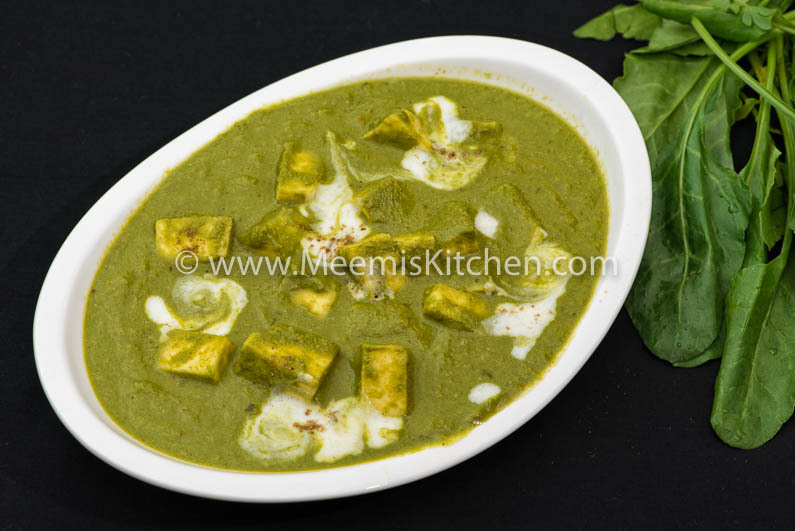 The combination of Paneer and Palak is delicious as well as nutritious. Some make it with fried Paneer cubes, some like it with fresh, soft paneer cubes. I have tried both and both are great with distinctive flavors and appeal. I have tried several recipes and like this one the best; which gives the lush green color and amazing flavors. You can try adding Chili powder and adjust the green chilies, but it will not give you the bright green color. In this recipe I have added fresh paneer cubes/ If you like it fried, just fry them in butter and add.. Since I get fresh Palak from my home garden and Paneer is easily available, this is a very regular dish at home. Rich in nutrients, iron, anti-oxidants and calcium, Palak Paneer is a great healthy choice for family meal. It is hard to make kids eat Spinach but with delicious Palak Paneer and their favorite Butter Naan there is no need to force them. The nutritious greens make their way to their plate and stomach without any fuss!! It is best served with Indian breads like Butter Naan, Rotis, Lachha Paratha, Pulao or Jeera rice. Like Paneer Butter Masala, Paneer Korma, Chili Paneer or Paneer Matar, this is another favourite Paneer dish at home. Hope you will try this recipe and enjoy a scrumptious Punjabi meal. Wash and clean the Palak leaves and soak in water for 10 minutes with little salt. Drain. Boil half glass water in a wide vessel and add enough salt. Take out from fire. Put the washed Palak in this water and immerse the leaves in water, gently turning with a spoon, till all the leaves are limp. Cover and keep for just a minute and drain. Keep this water aside. Cut the Paneer into cubes and soak in hot water for 10 minutes to make it soft. 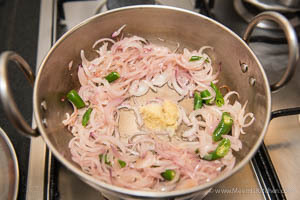 Heat oil/ Butter in a pan and add sliced onions and slit green chilies. Sauté till limp and add ginger garlic paste. Fry for some time and add a pinch of turmeric , Jeerah/ cumin Powder and Garam Masala powder. 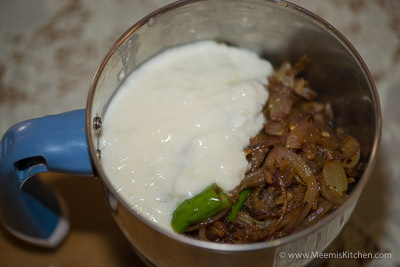 In a blender, grind the onion mix with curd and make a smooth paste. 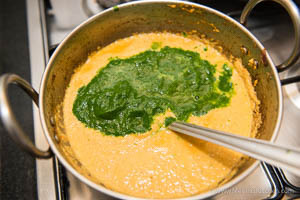 Puree the Palak and add this also to the gravy and combine well adding enough water (drained from blanching the palak). 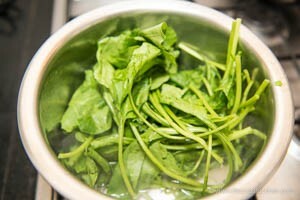 Adjust the salt, squeeze half a lemon and add Kasuri Methi (optional) and bring to a boil. Add the Paneer cubes and mix well. Cover and cook on low flame for two – four minutes. Turn off the heat and transfer to a serving plate. Decorate with cream or grated cheese and chat Masala. Serve hot. 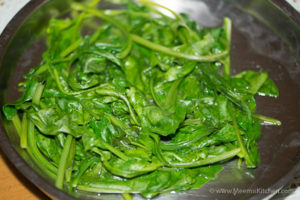 Always use fresh Palak (the thick leafy spinach). You can cut down the green chilies and add Chili powder. The gravy will be slightly brown in color but delicious. Soaking Paneer in hot water for 5 – 10 minutes makes it soft. 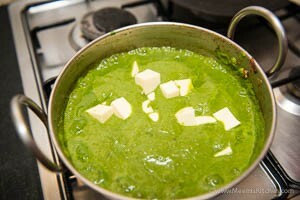 You can also fry/ Sauté the Paneer pieces in ghee before adding to the gravy. Add a spoonful of ghee/ butter while sautéing the onions for amazing flavors. I add cream only for special occasions, I usually put grated cheese a little. I have used soft Malai Paneer for this recipe. Serve with Naan, Rotis or rice. I always serve this with Whole wheat Naan. Please try and let me know if you like this recipe or share with your friends using the share buttons on the side. It will definitely motivate me. God Bless!! I’m a palak paneer fanatic, so I’ve tried a number of recipes at home. This is easily my favourite. The flavour and texture are amazing! I have one quick question: when you say to add a ‘pinch’ of cumin and tumeric, how big are these pinches? Your pureed onion/spice/curd mixture looks much yellower than the version I made.